Product #21143 | SKU 137954 | 0.0 (no ratings yet) Thanks for your rating! Featuring a dust- and splash-proof construction, this lens is ideally-suited for use in outdoor and adverse conditions. Its design features rubber focus and zoom rings as well as conveniently located mode switches to enhance usability with the lens. A built-in Optical Stabiliser provides a four-stop-equivalent reduction in the appearance of camera shake, helping to enable better handheld usage and low-light shooting. The Hyper Sonic AF Motor provides fast, smooth, and quiet auto focusing for faster performance that also benefits video recording. 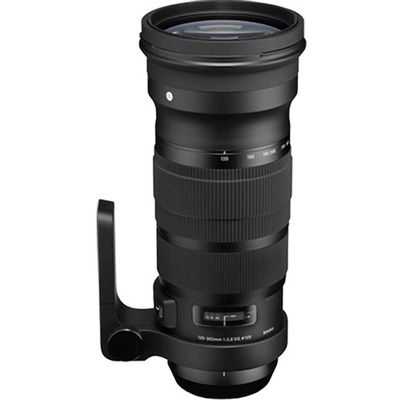 This lens is also compatible with the Sigma USB Dock, which allows you to use the Sigma Pro Optimisation software to fine-tune certain lens settings to your own shooting needs. The ability to limit focus range, alter the AF speed, and modify the OS system is afforded through this, as well as the ability to easily update the lens' firmware. This lens is the first lens produced as part of Sigma's Sports line, making it ideally-suited for capturing fast-moving action with high precision. Its telephoto-length zoom range and fast maximum aperture make it especially useful for sports photography as well as wildlife, birding, and other fast-paced applications. Also benefitting these shooting scenarios is a wide range of customisable functions availed through the use of the Sigma USB Dock. The lens construction integrates two FLD (F Low Dispersion) glass elements and one SLD (Super Low Dispersion) glass element to help reduce colour aberrations and sagittal coma flare to improve overall image quality. Lens elements also feature a Super Multi-Layer Coating to reduce flare and ghosting, which helps to improve image contrast and colour fidelity throughout the zoom range. This lens is compatible with the Sigma USB Dock for fine-tuning and personalising certain functions of the lens to fit your personal shooting style. A focus limiter can be set to constrain your lens' focusing distances to suit the distances at which you are shooting. Additionally, this lens features an inner focusing and zooming configuration so the physical length of your lens does not change during use; which greatly benefits the use of certain filters such as a polariser. The USB Dock also allows you to customise the speed at which the autofocus system performs, how active the Optical Stabiliser system is during shooting, and allows you to easily update the lens' firmware. The built-in OS (Optical Stabiliser) system enables a reduction in the appearance of camera shake up to the equivalent of four stops, resulting in a long lens that can easily be used handheld and low-light conditions. The OS system is divided into two modes; one for general shooting applications, and one that is better suited for panning shots of moving subjects. The OS system can be further adjusted to suit your needs through the use of the USB Dock.